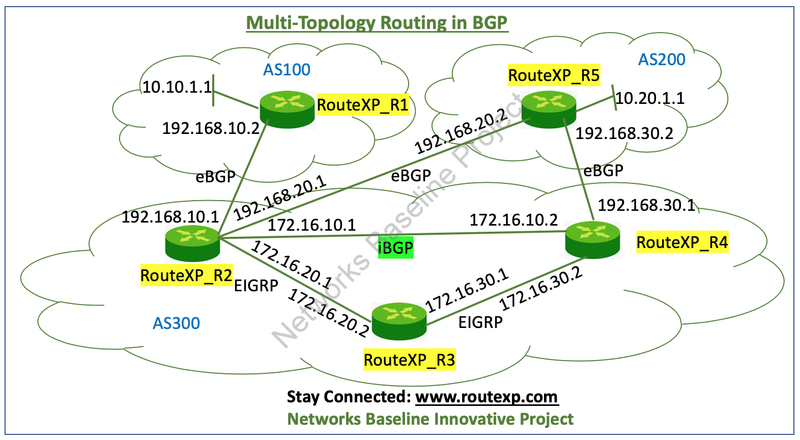 Today I am going to talk about Multi-Topology routing using Border Gateway Protocol (BGP). What is the purpose of Multi-Topology routing? We will discuss the same in this article followed by sample configuration in BGP.Multi-Topology routing supports multiple unicast topologies and a separate multicast topology. Multi-Topology routing offers independent forwarding abilities on a per topology basis. Multi-Topology Routing permits the device configuration of service differentiation through class-based forwarding. An independent forwarding table is preserved for each topology, permitting us to largely apply independent forwarding configurations or add a level of granularity to independent forwarding configurations. IP routing should be allowed on the router in order for MTR to function.Dynamic routing can be allowed per-topology to provision inter-domain and intra-domain routing. Route computation and forwarding are independent for each topology. Multi-Topology routing is supported on BGP, EIGRP, IS-IS and OSPF dynamic routing protocol. In OSPF, EIGRP, and IS-IS, the topology ID is inserted through the first configuration of the topology command for a class-specific topology. In BGP, the topology ID is configured by entering the “bgp tid” command under the topology configuration. As we earlier discuss above that BGP supports Multi-Topology routing by using the command “bgp tid” We are taking a topology and configure the Multi-Topology routing in the BGP.